This is easy to use, easy to apply and quick drying (1-2 minutes a coat). It's a pretty multi coloured glittery polish. I wanted to show it solo, but I'm sure it would look great as a topper too! Noticed slight tip wear, but last well otherwise. Thanks, fingers crosses these meds work soon. Thanks Marghe. Hopefully they will pass soon! Sorry to hear about your headaches. Get well soon, dear. That's a real beautiful glitter. Hope you're feeling better real soon. Headaches are the worst, so crippling. I hope you soon feel better, and hopefully the cuase. But finally I figured out the cause, and I have been without them 3 years now - that is heaven! This is a beautiful glitter! 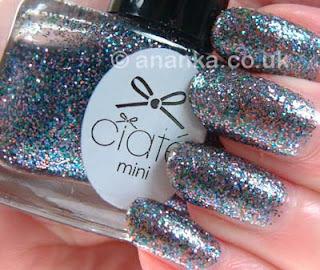 Love glittery nail colors - this one is gorgeous!! really nice!! !get well soon! !i hate hateheadaches!! Such a fun polish! Total glitter bomb!